I know, I know…for many, clipboards and office supplies are a thing of the past. Almost everyone takes meeting notes on a their phone or tablet. But I, for one, am a holdout. I am all about scribbling copious notes haphazardly across my yellow legal pad. If I need to remember it, it’s going on a piece of paper – although it will likely be eventually transcribed into an email or electronic document. I recently changed to a new department within my company and have been a bit intimidated by my new coworkers. I’m now the only woman on a team of very strong and assertive men. I spent the last week feeling out my new professional relationships and establishing my place in things. 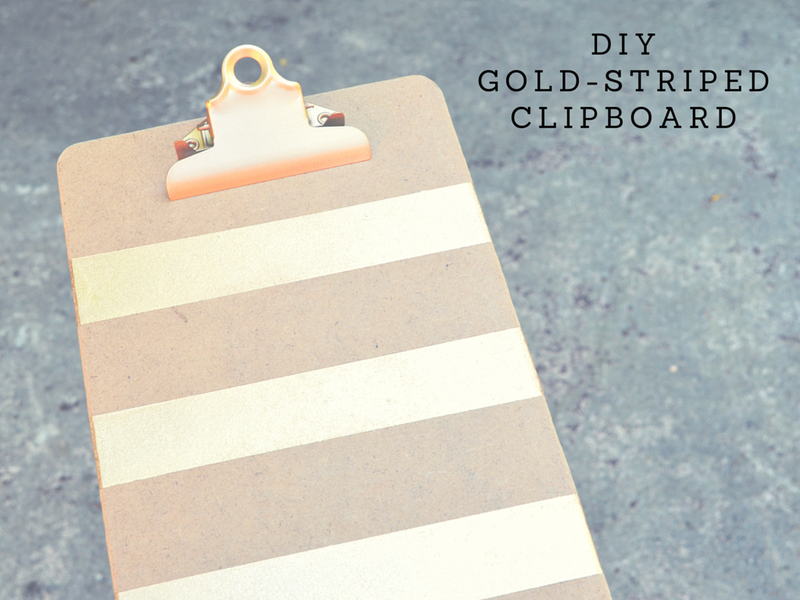 I actually made my gold clipboard myself and have liked it so much that I had to share! It took all of maybe 5 minutes to create and looks pretty chic, if I do say so myself. 1. 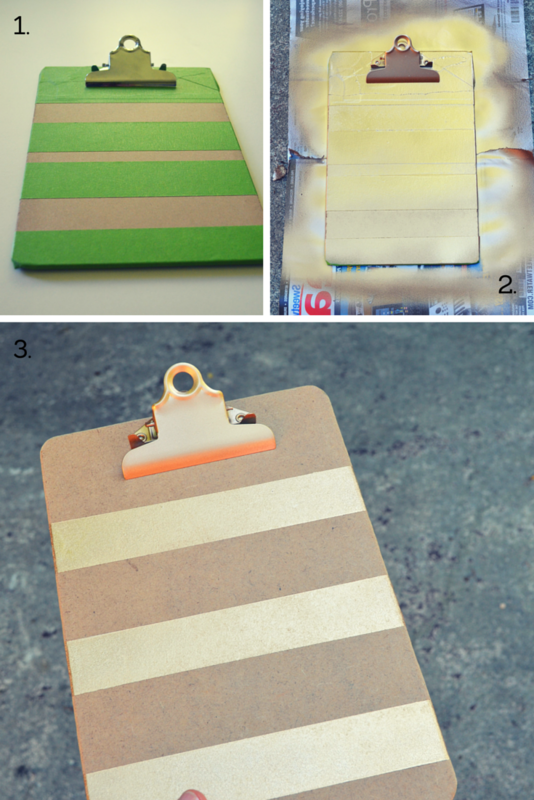 Start by placing strips of painters tape across the front side of your clipboard to create a striped pattern. I recommend starting from the top and working down. As you place your strips, remember that anything left exposed will be gold. You’ll want your clip at the top to be gold and I think it looks best when contrasted against a brown stripe. So start by taping your first stripe at the top, working around the clip to leave it exposed. You can make your stripes as big or small as you want (buy your painters tape accordingly), and can vary their width from top to bottom. If you’re picky, measure and mark the stripes, so your widths are precise (I am all about the eyeball). I liked the look of three thicker stripes of about the same width. 2. Once your tape is securely in place, head outside with your spray paint and newspaper. Spread your newspaper and lay your clipboard on top. You’ll want to evenly apply the spray paint from about 10 inches away to avoid drips. Don’t try to get full coverage with the first coat. You’ll get a smooth end product if you do 2-3 light coats, making sure to let each coat dry for about 20 minutes. 3. Once you’re satisfied with your paint coverage, let the last coat dry for about an hour before removing the tape and revealing your masterpiece. Now I only did the front of my clipboard, as that’s what I see and thus care the most about. But it would definitely look a little more polished to do both sides, so you could easily just repeat the process to the back. If you do this, make sure to match your stripes up, so they seamlessly flow from one side to the other. It’s a simple and fun project for a Saturday afternoon. If you still use pen and paper for your notes, bring your gold clipboard to work and see if you too feel like a Girl Boss. this is so fun and simple, but looks great! Thank you. That makes me feel good and I’d like too. Adorable! Such a great DIY. Oh girl I love it. You know I love a simple DIY and this is amazing. And it’s definitely cheaper than purchasing it. Amazing job girl. Thanks! I love a simple DIY too. If a project is too complicated, I’ll just buy it.